Pictured at the 1st North American Cashbook User Conference in Chicago are L-R: Michael Twomey, Cashbook; Mary O’Brien, Cashbook; Greg Coulter, Cashbook, Barb Skrletts, MTD; Kayla Beaudry, MTD; Diane Janke, Deublin; Will Hinshaw, Deublin; and David Rushe, Cashbook. 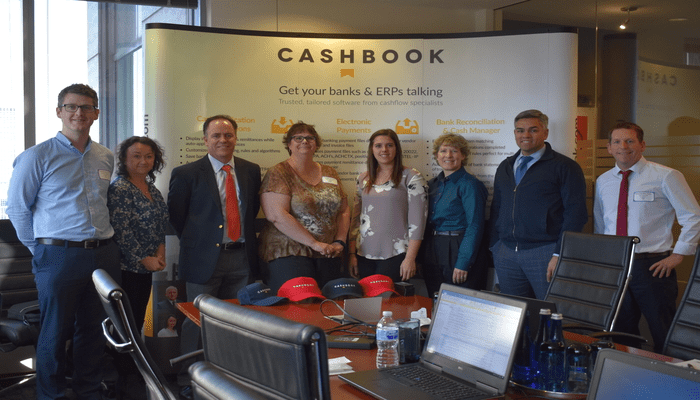 On Wednesday 18th October 2017, Cashbook held our first North American User Conference in Chicago, USA. This event followed the inPower conference of XA & BPCS/LX users which finished the previous day. Due to business growth in North America, Cashbook have been looking to start a user event for a long time. We wanted to make it an event where we share our current developments and our customers could vote on product enhancements. We shared our latest version, v5.7, and highlighted new user screens and some new functionality around remittance automation. We also communicated our vision for Cashbook and what we are striving to achieve with our short and long-term goals. Our users learned from the other attendees at this event. Many of our users apply cash slightly differently which leads to some small but helpful tips on making life easier for other users. The Cashbook User Conference started with Greg Coulter, CEO Cashbook, welcoming the attendees, and thanking them for making the journey from as far as Canada. Greg explained the history of Cashbook, how it came into existence and the timeline of the company so far. In the first educational session of the event, Greg discussed all the modules Cashbook have to offer and conducted brief product overviews of the following Cashbook modules: Cash Application Automation, Bank Reconciliation Automation, Electronic Payments Automation and Cash Manager. Greg revealed the new product features that have been designed and released this year, such as OCR Lockbox, Notes, Customer Portals and Aging. The second session saw Mary O’Brien, Product Development and Implementations Director, open the floor to users to assess the functionality of Cashbook, also if they had any feedback on issues or possible improvements. This session was very valuable, the users discussed the best features of Cashbook, and shared ideas and tips with one another in an open discussion. Users relayed minor issues that they were seeing in their daily Cash Application, ones which Cashbook were able solve for them on the day or later through slight customization of the product. Overall, this session was beneficial to both users and Cashbook Executives. There really is nothing better than getting direct feedback from users who spend hours in our product. The third and final session of the day saw David Rushe, Global Pre-sales Manager, reveal the new product features which are currently under development for a 2018 release. Both David and Greg discussed these features and the ones that got users most excited were – Customer Balance Reporting, Categorization of Aging, AP Remittances, Note Enhancements, and Discount Reporting. The ‘look and feel’ of Cashbook was also discussed here, with David showing how this has changed over the last 6 months. There were also some great ideas put forward on the ‘look and feel’ for the new Cashbook v6 release that is nearing completion. Overall, the 1st North American Cashbook user conference was very informative, we would like to thank our customers who attended on the day. It was by all accounts, a thoroughly enjoyable day with great networking opportunities and sharing of ideas, not only between Cashbook and its users, but also between the users themselves. We received great feedback after the event from the attendees, which has led to us to start planning for the 2nd Cashbook User Conference in Washington, D.C. next September. We trust all our users can join us there! The last word deservedly goes to Barb Skrletts, MTD, who travelled from Canada for the event. Barb Skrletts, Manager of Treasury Systems & AR, MTD.